"[When] you get past the age where youre capable of believing theres something carnivorous and hairy under the bed, you don't then lose your capacity for fear. The monsters go, and in their place, lucky you, you get to start imagining real calamities: losing your parents in a car wreck, becoming destitute, having someone you love turn on you, or doing something so shocking that the community ostracizes you." Adult Fears are about the things mature, well-adjusted adults generally are concerned about, as opposed to supernatural, petty, or far-fetched fears: the safety of their children, the safety of their neighborhood, the fidelity of their spouse, the loyalty of their friends and coworkers, the health of themselves and their family, being able to pay their bills, etc. To an adult (especially paranoid fathers), children being preyed upon by pedophiles or sociopaths can be scarier than children being preyed upon by a Xenomorph. 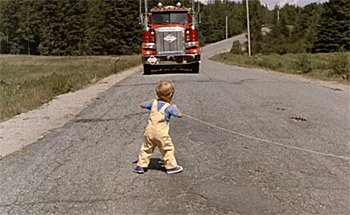 To be scared about a fictional monster requires artistic application of the Rule of Scary and a Willing Suspension of Disbelief from the audience, but to be scared about the Death of a Child simply requires enough absence of childhood innocence to be aware of the reality that this (God forbid) can actually happen. The audience reaction is still to be scared, but this trope plays down the shock factor of more fantastical horror and plays up the relative realism of more mundane threats. Outliving your children in general might be the worst fear of this kind. Often overlaps with Primal Fear. It is also the reason why tropes such as Mama Bear, Papa Wolf and Overprotective Dad exist. Can have political purposes as well as entertaining ones; expect to see them evoked all over the place in a Propaganda Piece. Defanged Horrors are the result of trying to target the youngest age group.